New York State is #1 in the production of yogurt, sour cream and cottage cheese and is also #4 in total cheese production. There has been tremendous growth in the numbers of companies coming to New York State to manufacture dairy products as a result of the high quality milk supply, proximity to markets and state-level and extension support that is given to the dairy manufacturing industry. Dairy Food Manufacturing also employs well over 8,000 people in New York State. Additionally, for every job created by dairy food manufacturers, an additional 5.6 jobs are created indirectly (i.e. through vendors, contractors, et cetra). With the growth and projected growth in dairy foods manufacturing, developing a workforce is essential to sustainability. The Dairy Foods Processing Specialists works with dairy plants, regulatory agencies, workforce development agencies and suppliers to educate a future workforce for the dairy foods manufacturing industry. 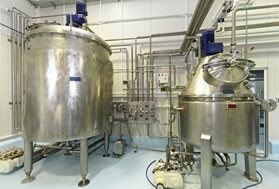 The Dairy Foods Processing Specialists also work with start-up companies. Harvest New York connects companies with technical and business resources and helps companies understand key considerations before entering the dairy business. These include providing insight into regulatory requirements, plant operations, understanding market dynamics, and emerging market trends. In New York State, 4,295 dairy farms produce 14.9 billion pounds of milk. As approximately 95% of milk received at New York dairy plants come from NYS sources (2016), dairy products employ over 63,000 employees and provide a $42 billion impact on the NY State Economy. The FDA's Food Safety Modernization Act requires food-processing facilities to write and implement comprehensive food safety plans to prevent recalls and protect public health. The Harvest New York Dairy Processing Specialists can review Food Safety Plans of New York dairy processing facilities to ensure they are complete and comprehensive. Harvest New York Dairy Processing Specialists work directly with Cornell's campus-based Dairy Foods Extension team. Harvest New York Specialists extend the knowledge and resources from the Dairy Foods Extension team to their respective Northern and Western New York regions. This collaboration fosters direct communication with industry stakeholders and keeps Cornell's dairy research team aware of current and relevant industry needs. One of the first questions often asked when an individual is considering adding value to their milk is, "How much capital investment it is going to take to start a project like this?" While this is a critical question when starting a business, many people do not consider the other hidden costs associated with actually operating a value-added dairy business. Food safety is a topic that new processors don't typically think about in the beginning. Here are our top 3 things to consider when looking into value-added dairy processing.